Your Daily Dose of Dense Nutrition! Ready to try Shakeology? Click here! Shakeology® is the most delicious, nutrient-dense, superfood-packed protein shake on the planet. It’s made with the healthy stuff you should be eating every day, but typically don’t. Shakeology’s the perfect combination of proteins, phytonutrients, antioxidants, enzymes, prebiotics, and probiotics. Plus, it also contains many rare ingredients, including adaptogens, camu-camu, and maca root—things we can’t get from an ordinary diet. So whether you use Shakeology for weight loss, or drink it to optimize your health, this powerful and delicious shake is Your Daily Dose of Dense Nutrition®. Top 8 benefits of drinking Shakeology every day! say it helped improve their regularity. full until their next meal. 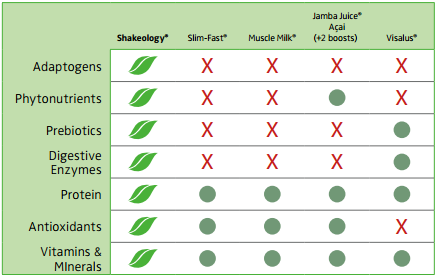 Shakeology is the only one that provides them all in one shake! Shakeologys proprietary blend of digestive enzymes, prebiotics, and probiotics helps your body eliminate toxins that have built up over the years due to eating bad food. And its 100% whole-food ingredients fuel your body with essential vitamins, minerals, proteins, and nutrients that the average diet lacks. Here’s the bottom line: If you want to live healthy, you’ve got to eat healthy—and Shakeology is the easiest and most affordable way. That’s because Shakeology is NUTRITION SIMPLIFIED. EveryBODY is different. So everyone has a different reason for drinking this nutrient dense shake. Simplifies your meal plan. And if you’re doing a Beachbody fitness program, Shakeology gives you the extra oomph you need to push through your workouts, which can aid in weight loss, as well as maximizing your fitness goals. Increases energy levels, which helps you stay active, as well as helping keep you healthy so you can enjoy life. A quick and convenient way to get complete nutrition. Supplies more energy to help you keep up with kids and a hectic lifestyle. Ready to place your order? BUY NOW!